Every story can change a life. Growing up isn't easy. Many young people face daily tormenting and bullying, and this is especially true for LGBT kids and teens. In response to a number of tragic suicides by LGBT students, syndicated columnist and author Dan Savage uploaded a video to YouTube with his partner, Terry Miller. Speaking openly about the bullying they suffered, and how they both went on to lead rewarding adult lives, their video launched the It Gets Better Project YouTube channel and initiated a worldwide phenomenon. 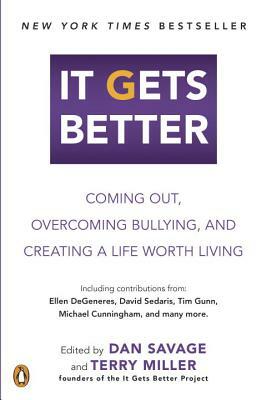 It Gets Better is a collection of original essays and expanded testimonials written to teens from celebrities, political leaders, and everyday people, because while many LGBT teens can't see a positive future for themselves, we can. Dan Savage is the editorial director of Seattle's weekly newspaper, The Stranger. Terry Miller is an event promoter, musician, and DJ. They were married in Canada and live in Seattle with their son, DJ.